Finally I’m home from hospital, where I spent 2 weeks. That’s why I couldn’t respond my mail and update website. Also release of the next version will be some weeks later. I think that in next week I will release a beta version. It’s been a year since I started to work with Doom sources and a new version 1.4 is out, you can get it at downloads page. In-game joining is now done, also fixed some other bugs. Actualy I didn’t thought, that after a year I will have something like this. That I will create not just another source port, whitch haves features, that are in almolst all other ports. That I will add 3 big features, that are not in any other source port. And the features are realy big. The first one is Doom, Doom2, Heretic and Hexen support. After adding second feature it was a lots easier to make it. And this second feature is progs, inspired by the Quake’s progs. I created Vavoom C programming language and a compiler. Almolst all game specific code is moved to the progs. And finaly the third feature – a pure client/server architecture. Interesting, what I will have next year. Version 1.4 BETA is available at downloads page. In short there is only one, but big change – it’s pure client/server architecture. Is it better that csDoom? Whell, I hope so, because csDoom is not a pure client/server, but a very mystic peer-to-peer and client/server mutation. So check out this BETA version and send me all bugs that You find. I hope that version 1.4 will be released in next week. Released version 1.3. It’s available at downloads page. Well, in this version I reworked network stuff. DOS drivers now are moved in the main executable. Completely rewrote network protocol. 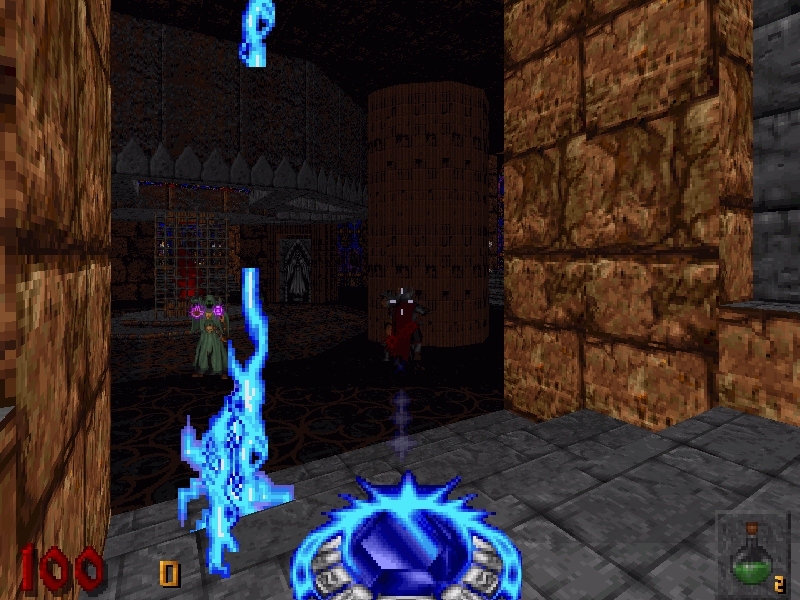 Vavoom now uses peer-to-peer with multicast server connection type (in Doom Legacy it is called basic client-server). Now 4 players on IPX is really playable. Happy fraging! The work on Vavoom continues. The next version will be released very soon. Possibly in next week. This version will not have meny changes, but some of them will be very importan. So. let’s see what will be on next week. As promised, version 1.2 is out. It’s available at downloads page. What’s new? Unlike version 1.1, which was only compiled as C++, this version realy starts to use it. This makes coding a little bit easier, players will not feel any difference. Some functions now are in assembler, which will make code a little bit faster. Also improved dehacked support, it is also added to makeinfo utility so now You can create progs with changes from dehacked patch. Version 1.2 will be released in this week. Released version 1.1. It’s available at downloads page. The biggest attention was putted on sound, music and CD-Audio stuff. Fixed some bugs, created some optimizations (especialy in Windws version). In Windows version added 3D sound support (if hardware supports it). Also some changes in console and command execution.